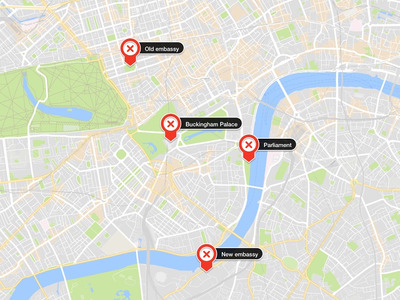 President Donald Trump has cancelled his planned trip to Britain, where he was due to open the new US embassy. The decision to sell the old embassy was actually taken during the George W Bush administration and reportedly driven by security concerns. The new 12-story glass embassy, which is scheduled to open on January 16, cost $US1 billion (£730 million) – making it the most expensive embassy ever built. This is the US new embassy in London, which cost $US1 billion and will open on January 16. 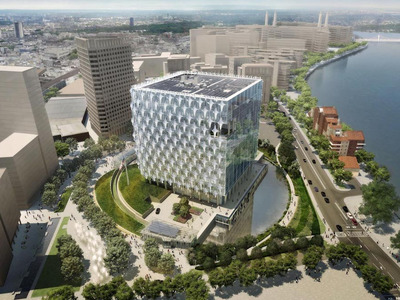 KIERAN TIMBERLAKETimberlake’s design of the new US embassy in London. The embassy rests on a hill about 100 feet back from the street, and the moat has waterfalls and deep trenches that could stop a truck bomb. It’s even beset by a 6-inch blast wall, which adds to the large price tag. The building will also produce more energy than it uses: the roof is filled with solar panels, and the white part of the exterior is a plastic polymer that increases it’s energy efficiency. 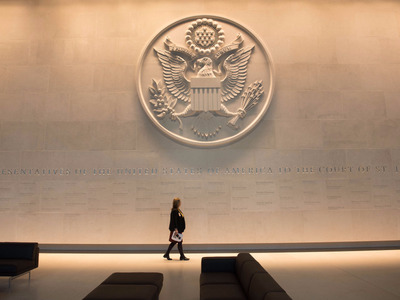 Here is the lobby entrance, which is adorned with the US State Department embossed seal and the names of every US ambassador to the United Kingdom. Here is a view of the consular lobby, decorated with a sculpture of a typical home in 1950’s America. In the consular section of the embassy is a huge photograph of the Winfield House garden, the official residence of the US ambassador to the UK. The plastic polymer veil offers a view from the inside out. There are also a dozen gardens in the embassy. Above is the Canyonlands Garden, which represents the Grand Canyon and the south west desert landscapes of the US. This is the visa and consular section. Here’s the consular section, which was still filled in boxes in December. The embassy also has a bar. It even has a gym, post office, Marine barracks, and probably a CIA station. There’s a cafe too, which is decorated with glass tiles of the US State Department seal. And finally, here’s Woody Johnson, the US ambassador to the UK, giving a tour in the video below.